Victoria, Mahé (Seychelles) – March 23, 2017 (travelindex.com) – Seychelles Tourism Minister Loustau-Lalanne endorses former Minister St.Ange as the island’s Candidate for SG of the UNWTO in function at ITB in the presence of Taleb Rifai the outgoing SG of the UN Body. 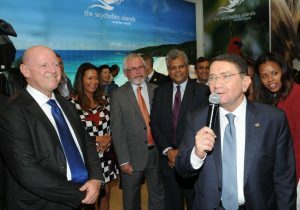 The Seychelles Stand at ITB in Berlin was buzzing on Thursday late afternoon as Taleb Rifai, the Secretary General of the UNWTO arrived at the Seychelles Stand with his entourage for the island’s cocktail event. Also present was Anil Gayan, Tourism Minister of Mauritius, Najib Balala, the Tourism Minister of Kenya, Joachim Duster, from the Federal of Germany Federal Office, Lela Krstevska from the Government of Macedonia Tourism, a number of officials from Tourism Departments from around the world and also members of the Tourism Trade. Edith Hunzinger , the Seychelles Tourism Board’s Manager for Germany, Austria and Switzerland was the one honoured to open the formal part of the evening before handing over to Sherin Francis, the CEO of the Tourism Board who spoke about the successes of the island’s tourism before speaking publicly to her former Minister Alain St.Ange saying that she wanted to wish him well and assured him that the island’s Tourism Board was proud of him and supported his candidature. Roy Kinnear, the CEO of Air Seychelles on his part spoke about the Air Seychelles new direct non-stop flights to Dusseldorf and then called on Minister Maurice Loustau-Lalanne, the new seychelles Minister of Tourism, Civil Aviation, Ports and Marine who used the opportunity to formally endorse Alain St.Ange, the Seychelles Candidate for the post of Secretary General of the UNWTO. “We are right behind you, we wish you success in the coming UN elections and we look forward to tango with the UNWTO” said Minister Loustau-Lalanne. Alain St.Ange, the Seychelles former Minister for Tourism, Civil Aviation, Ports and Marine and now Candidate for the post of SG for the UNWTO started off his address by thanking Minister Loustau-Lalanne for his support and good wishes and also Sherin Francis and her Tourism Board team their support. Former Minister St.Ange also thanked Taleb Rifai of the UNWTO for being present at the Seychelles function with his entourage and also Minister Anil Gayan of Mauritius and Minister Najib Balala of Kenya for being present. “Today I say thank you to Taleb Rifai, the outgoing Secretary General of the UNTWO for being present. We worked closely with you and appreciated your successes and accomplishments for tourism. I need to reassure you and your Team at the UNWTO that if I am chosen as your replacement your legacy will be safeguarded as we also move the UNWTO forward to face the challenges of the new era. Much will be done to face the challenges of each region as the UNWTO grows to respect aspirations of each Member State and together face their challenges. I assure everyone to remain focused on the 11 and 12 May when the UNWTO elections will be held” said St.Ange of the Seychelles. Taleb Rifai took the mike to deliver the final speech of the night and thanked Alain St.Age for his work for tourism and for getting him to Seychelles for the second edition of the island’s Carnaval International de Victoria. “It was a trip that I remember vividly as the welcome, the people and the beauty of the islands marked me” Taleb Rifai said before adding that he wished Alain St.Ange well in the coming elections for the new SG of the UNWTO. The Seychelles Tourism Board (STB), is a public/private sector body headed by CEO Mrs. Sherin Francis, with Mrs. Kathleen Mason as the Chairperson. The Seychelles Tourism Board’s primary function is to promote and market Seychelles as the most desirable tourist destination. Our Mission is to achieve for Seychelles the status of the most desirable island destination on the market offering the unique Seychellois way of life, at a price that is competitive and within a sustainable, eco-friendly environment which is protective of Seychelles’ natural beauty, assets, and cultural heritage. In its drive to further raise visitor numbers, the Seychelles Tourism Board shall continue to develop and maintain an authentic, dynamic and sustainable tourism product at home reflective of the importance of Seychelles tourism industry to its economy and to the standard of living of its population. The Seychelles tourism product shall be constructed upon a base of professionalism and value for money, offering visitors a unique experience, as the foundation for parallel, innovative and cost-effective marketing campaigns throughout core and emerging markets. At, the same time the Seychelles Tourism Board shall promote the gradual expansion and enhancement of existing tourism facilities, services and infrastructure to provide additional activities for visitors with increased revenue potential and appeal across a broader spectrum of markets. The STB has offices in the France, United Kingdom, Germany, Italy, South Africa, Abu Dhabi, China-Beijing & Shanghai, Hong Kong and Spain as well as representations in the Middle East, India, Brazil, South Korea and Russia.